Juilliard Opera takes on Die lustigen Weiber von Windsor. When Giuseppe Verdi ended his career with Falstaff, he was not the first composer to take on Shakespeare's corpulent knight as an operatic subject. In 1847, the mostly forgotten Otto Nicolai wrote Die lustigen Weiber von Windsor, a singspiel of considerable flexibility and charm. Nicolai's score, which sets Sir John's amorous adventures to an enchanting series of Viennese waltzes and florid writing for a large cast, is being staged this weekend at Juilliard, in the intimate Willson Theateron the conservatory's third floor. It opened Wednesday night.
.) The result: a smart and canny performance that used the best from both playwright and composer. Less successful (and ultimately unnecessary) was the decision to update the action a munitions factory in Windsor in 1941. 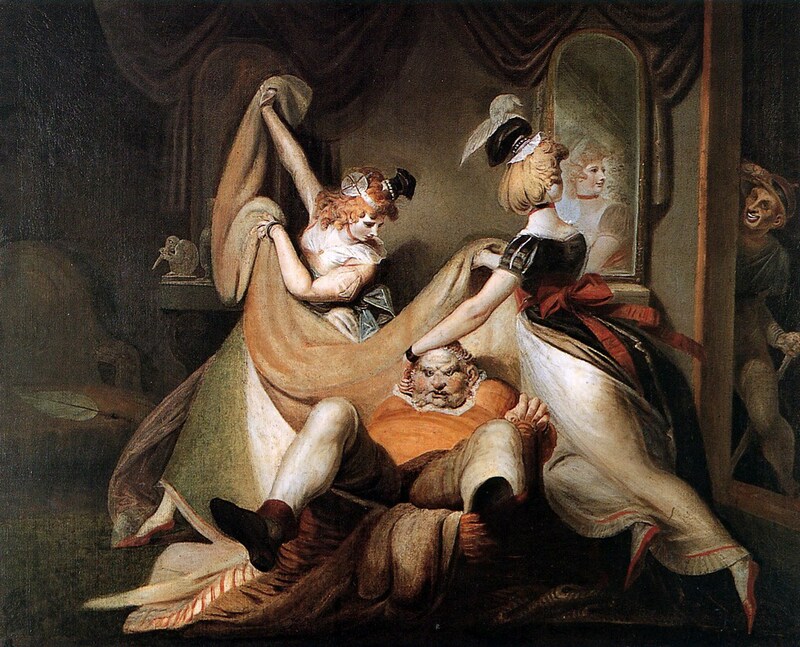 Andrew Rosen was Falstaff, here portrayed as a British Army officer with an elaborate, sweeping mustache and the traditional gut-pillow, that jutted forward like the prow of some enormous water-craft. He played the role of the fat knight to the hilt, capturing the character's bottomless joie de vivre as well as the melancholy, philosophical side of Jack that makes him so memorable. His comic confrontation with the jealous Fluth (played by promising Polish baritone Hubert Zapior) was a definite selling point in the second act. Shakespeare wrote The Merry Wives because Queen Elizabeth loved the Falstaff character and wanted to "see him in love." This show certainly offers that, putting Falstaff and his amorous ambitions against the wizardry and schemes of Meg and Alice. Whether being dumped in the laundry basket, dressed as an elderly woman (this is the only operatic version of Wives to include this plot point) or putting on antlers as Herne the Hunter, this was a most memorable vision of old, plump Jack. However, as Falstaff's traditional cohorts Bardolph, Nym and Pistol are missing from this version, the old guy sometimes seems outgunned. Much of the clowning is given to Spärlich (Matthew Pearce) and Dr. Caius (Andrew Munn) the two gentlemen who are obsessed with wooing Anne. This little triangle and Nan's actual love story with Fenton (John Chongyoon Noh) provided some of the most memorable melodies and enjoyable grist. Soprano Jessica Niles is a promising talent, as is Mr. Noh. The scene stealer was Mr. Munn, clomping about in a great pair of work boots and speaking with an outrageous accent, he then proved to have an impressive, full bass with pleasing low notes. Although Mr. Giampetro's attempts to include more aspects of Shakespeare sometimes seemed forced (a drinking scene with a vision of Prince Hal is especially awkward) this was an admirable performance of an opera that demands further study, performance and revival. At the conclusion of the third trick in Windsor Forest, Falstaff went to each of the cast in turn, apologizing for his behaviors and promising to reform himself. He then did the same to the audience, going from seat to seat with muttering "I'm sorry, I'm sorry." But with comedy like this, no apologies were needed.